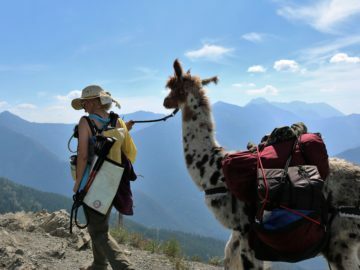 We believe, at Swan Mountain Llama Trekking, that you should have as much information as possible to help you decide which llama trek or adventure is right for you. Listed below are several llama facts and frequently asked questions regarding our guided llama treks, our location, what is provided/needed, etc. We are constantly adding to this list so be sure to check in often or just email us with your questions. What do people do with llamas? Are they similar to horses? What is a llama’s gestation period? How much weight can Llamas carry? Do we have to pack in food for the llamas? What if we encounter other animals? How many miles do we travel a day on average? Do we set up our own tents in camp? Do we each get to lead our own llama? What are the sleeping accommodations/arrangements? 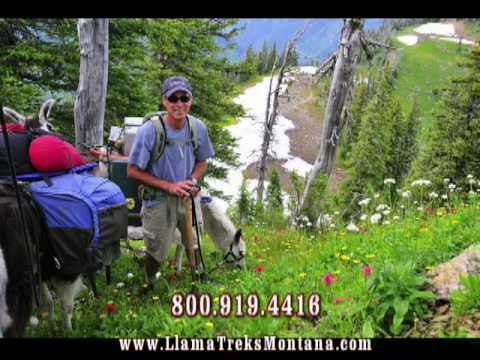 What is the difference between mule/horse pack trips and llama pack trips? What is the elevation range we will be subject to? Do we have to bring water? Can we consume alcohol on a trek? Where do we start and how do we get there? Where do we go to the bathroom or take showers? What about lodging before and after our trek? What about before and after our trip? How long does it take to adjust to the altitude? If something happens on the trip, how do we get medical attention if necessary? How safe are the llama treks? How do the licenses for fishing work? How can I prepare for this trek? The natural curiosity and intelligence of llamas makes them outstanding packing partners. Llamas can be handled by people of all ages and without experience. By trek’s end, you will have a new hiking companion. There are many answers, but here are the most popular: Packing, showing pet/companion animal, breeding, fiber, guard animals for other livestock, and sometimes they are used as pet therapy animals in nursing homes and hospitals. Yes, they sometimes spit at each other but normally not at humans. It’s reserved for llamas that invade their “personal llama space” or compete for their food. No. They are a form of livestock but llamas are in a class all by themselves. Llamas are super intelligent and willing to please as long as they know what you want them to do. They are quiet, curious animals that are always interested in what is going on around them. They are good friends to have. Our llamas are not trained for riding so we do not offer this activity. However, some llamas, led by adults, may carry lightweight children on their backs. Llamas can also be trained to pull carts individually or as a team. Llamas carry about 20-25% of their body weight, or 75 to 100 pounds. Llamas are very self-sufficient browsing on mountain cuisine so bringing food for them is not necessary. However, we always bring some treats for them after a hard day work and more importantly in case one gets loose. Depending on terrain, llamas go about 1 ½ to 2 mph which is a comfortable pace for humans. Just about the time you’re ready for a break on a hill climb, they are too! Llamas are much more keenly observant on the trail that we are. They are usually the first to see distant elk, deer, mountain goats, eagles and other critters which helps us to spot them, too. Except for friendly camp deer that are used to us, wildlife, including bears, stay away from our groups of hikers and pack stock. If nearby bears or anything else threatens llamas, they make a loud alarm call (which is good for us!). Because llamas are much more agile and calm, we yield the trail to any passing horses or mules. Loose dogs can create problems on narrow passages so should always be kept under control on trails shared with llamas and other pack stock. We do not allow dogs or other pets on our trips. The trip begins out of Swan Mountain Ranch, which is 1 mile off of Montana Highway 83 just 7 miles south of the village of Swan lake. We load up guests and llamas and drive to the trailhead rising approximately 2000 feet in elevation. If you want to order topo maps from U.S. Geological Survey (Denver, CO 80225 or Renton, VA 22092), you should request these quadrants: Cilly Creek and Thunderbolt Mountain. It depends on the group. If it is a relatively easy kind of trek, then probably a couple miles a day. If it is a more strenuous type trip, then we can go about 8 miles per day. We can also go anywhere between. Yes, but the guide will help you if you need assistance in your chosen spot. Helping out is part of the fun! Yes, if you like. If you prefer not to, our guide is happy to string them. There are 2 and 4 man tents for use depending on your party. If parties are combined for a trip there will be separate sleeping arrangements. Llamas are a low-impact version of horses/mules when it comes to pack trips. You don’t ride llamas, so the distance we will travel will be less. Because llamas pack less in weight than mules, there is an 80 pound weight limit per llama. The highest we’ll get is 8,000 feet with the average on our Alpine Trail trip being 6,000’. You should carry water to drink while on the trail. We bring water filters for refilling everyone’s bottles. You may have moderate alcohol, none will be furnished. Because we are at altitude, we often encounter mosquitoes in the early part of the summer, and horse flies near the end. BRING INSECT REPELLENT! No, for their own safety and the comfort of others we do not allow pets. We start all of our treks at the Swan Mountain Ranch. You need to meet us there, or you can arrange to stay there the night before and/or after your llama trek. We practice “Leave No Trace” principles for going to the bathroom. You will have to dig a shallow hole to do your business and then cover it up. Regarding showers, we will provide a solar shower unit for your convenience or you may rinse off in the lakes. If you are driving there are some local hotels nearby in Condon or Swan Lake, or bigfork that will make for a shorter drive to the ranch the morning of your trip. If you are flying into Kalispell or Missoula before your trek , we recommend finding a hotel with an airport shuttle. We can then pick you up the morning of your trek. For our multi-day trip guests, we will provide a transportation questionnaire that helps identify some options you have. Many people are adding this trip to an extended vacation that includes a visit to Glacier National Park and/or the surrounding area. We are proud of where we live and truly enjoy assisting our guests with options of things to do and places to see before or after their trip with us, so please don’t hesitate to ask! Our treks do not travel very high in altitude. That said, if you live at sea level – everything seems high. If possible, we recommend arriving 2 days before your trek to adjust to the altitude. People react in different ways and in different time frames to the change in altitude. Our guides are trained in wilderness first aid. The guide will have a satellite phone. We will be in the backcountry and that means possibly being hours or days from the trailhead where medical help can be reached. The most important thing for guests to remember is that guiding is a service business, and all guides and wranglers throughout the world rely on their tips as part of their earnings. Having said that, like any service, they must earn it. There have been many published guidelines on the amount to tip, e.g. $25-40 a day per person for a guide or 10-15% of the trip cost. If you are coming with a group, it is always a good idea to talk with others about how much they plan to tip, so as to avoid embarrassment. Also give the tips to the individuals themselves rather than a pool to be split up. We highly recommend purchasing trip insurance to cover your expenses and non-refundable deposits in the case that you have to cancel, or an unforeseen event such as a fire closes an area, your flights get canceled, etc. Travel Guard offers insurance plans designed to cover US and international residents’ needs. Plans include valuable medical coverage, trip interruption, emergency travel services and more. The physical safety of our guests is a priority for us. Each of our guides is an experienced trail guide and is certified in wilderness first aid. There are both Grizzlies and Black Bears in the area. While there may be an opportunity to spot one, the bears are not at all interested in us, and do their best to avoid us. The llamas act as great watch dogs! We follow all the appropriate safeguards to minimize bear attraction to our camps, and encounters on the trails. Additionally all personnel are equipped with firearms as well as bear spray. In over 35 years of operation, we have never had a dangerous encounter. In the unlikely event we were to have one, we are prepared to protect you. Although there is always a risk, we want you to rest assured that you will be safe. Montana has various options for fishing licenses, so the one you get depends on how long you will be in the state and how many of those days you intend to fish. They are: 2-day ($25); 10-day ($53.50); and Season ($70). The best way to do this is on line before your trip at fwp.gov.mt. If you arrange for us to pick you up, we can usually stop at a sporting goods or convenience store on the way to the Ranch so you can get your license. If you are driving yourself, you’ll want to do that before you get to the Ranch. If you elect the two-day license, have it dated with the second day of your trip as the start date. If this all seems confusing, please ask. Participants should be in good general health, as treks require at least some walking at higher elevations. You should do a fair piece of walking before you get here in order to enjoy your trek more. Guests should be prepared for a variety of mountain weather conditions and the possibility of some cold temperatures. Rain gear and warm clothing are essential.